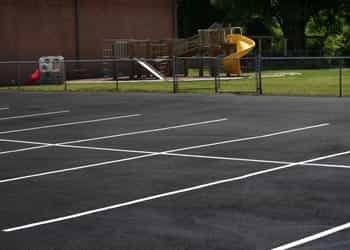 Asphalt pavement marking and striping can make all the difference in the look and function of your parking area. Parking lots that are properly laid-out and painted will create a sense of safety and organization for vehicular and pedestrian traffic — and remains an essential and vital aspect of most parking lot paving projects. Even a perfect paving job can turn ugly with inadequate striping. The experts at A-1 Asphalt Inc can handle your pavement marking project from start to finish, including design and layout planning, handicap striping, traffic flow patterns, stenciling and safety markings. Our professionals have both the knowledge and experience to offer a full range of services for your next asphalt parking lot or road striping and marking project. Whether you are in need of parking lot striping and marking, restriping of parking spaces and handicap parking signage — or customized specialty striping for speed bumps, bollards or other unique options — our experienced asphalt contractors can handle all of your striping and pavement marking needs.